Exploring the facts and fictions behind a dozen Williams legends. In 225 years, Williams has amassed a formidable collection of stories. They have been passed down by generations of Ephs to be shared during campus tours, in first-year common rooms, in classrooms and even around the world. But are they true? We asked students, faculty, staff and alumni to tell us their favorite tales, and then we set out to prove—or disprove—those stories using archives, interviews, contemporary newspaper accounts and clues gleaned from rare old books. Here’s what we found. Stories of the dead—and undead—abound at Williams. Among the tales, Susie Hopkins allegedly haunts her former home, now a senior-year co-op that bears her name. And college founder Ephraim Williams’ final resting place in the college chapel may be neither final nor resting. UNKNOWN: Susan S. Hopkins died in her Denison Park home in 1944 at the age of 89, writes Ernest Imhoff ’59 in a 2016 essay about Hopkins Gate and the “Climb High, Climb Far” poem that adorns it. Imhoff notes that Susie, the last surviving child of Williams President Mark Hopkins, Class of 1824, discovered the poem on a scrap among the papers of her uncle Albert Hopkins, Class of 1826. Susie was the once-anonymous donor of the gate and stairs and a founder of the college infirmary. Her former home is now a senior co-op. Her paranormal status is unknown, but her good works live on. The circumstances of the death of Col. Ephraim Williams Jr. are well known; what happened to his remains, less so. On Sept. 8, 1755, during the French and Indian War, he and Mohawk leader Theyanoguin (and most of their command) were ambushed and killed outside the village of Lake George. Professor of history and political economy Arthur Latham Perry, Class of 1852, recounts in the 1900 edition of his book Origins of Williamstown that Williams was hastily buried under a tall pine tree on the battlefield. In 1920, a college committee seeking to honor Williams traveled north to exhume his remains and found “nothing. 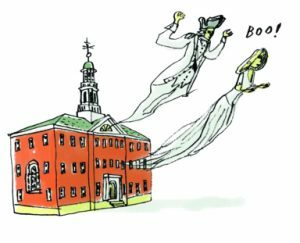 No bones, no traces of a uniform, just dust,” wrote Steve Lawson ’71 in the summer 2000 Williams Alumni Review. The committee carefully collected the dust in an urn, which was paraded through campus during commencement and interred in the basement of Thompson Memorial Chapel. A marble door with the initials “EW” and the date 1755 marks the location of the crypt. What lies behind that sealed door in the wall is anyone’s guess. Mission Park was designed by a prison architect to be riot proof—or at least to thwart student protests. Hence the lack of long, straight hallways and the existence of few right angles in the building. FALSE: In his 2001 book Reflections on the Architecture of Williams College, Whitney Stoddard ’35, the legendary art history professor and one-time director of the Williams College Museum of Art, called Mission Park “the most photogenic Williams building.” While some might quibble with this description, Mission’s architectural distinction is undeniable. 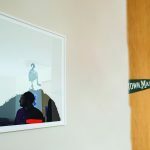 With coeducation on the horizon, the college conceived of a residence hall that would accommodate an increase in the number of students and respond to the physical environment. Williams hired the Philadelphia firm Mitchell-Giurgola Architects, which had no prison experience but did design buildings for the University of Pennsylvania and University of Kentucky. The proposal initially called for four separate but connected residential houses, each with its own living, dining and recreational space. When four dining halls proved too expensive, the plans were scaled back to one. The design for the 12,000-square-foot residence hall was completed in early 1969 and received a Progressive Architecture award. According to Stoddard, the structure’s “curving forms with cylindrical stairwells that play against flat surfaces” are reminiscent of the work of Le Corbusier. Mission Park was named for the 1806 “haystack meeting” that took place nearby, in which five students, sheltering beneath a haystack during a thunderstorm, “were inspired with the idea that led to the beginning of the American foreign missionary movement,” according to the Sept. 19, 1968, Times Record of Troy, N.Y. 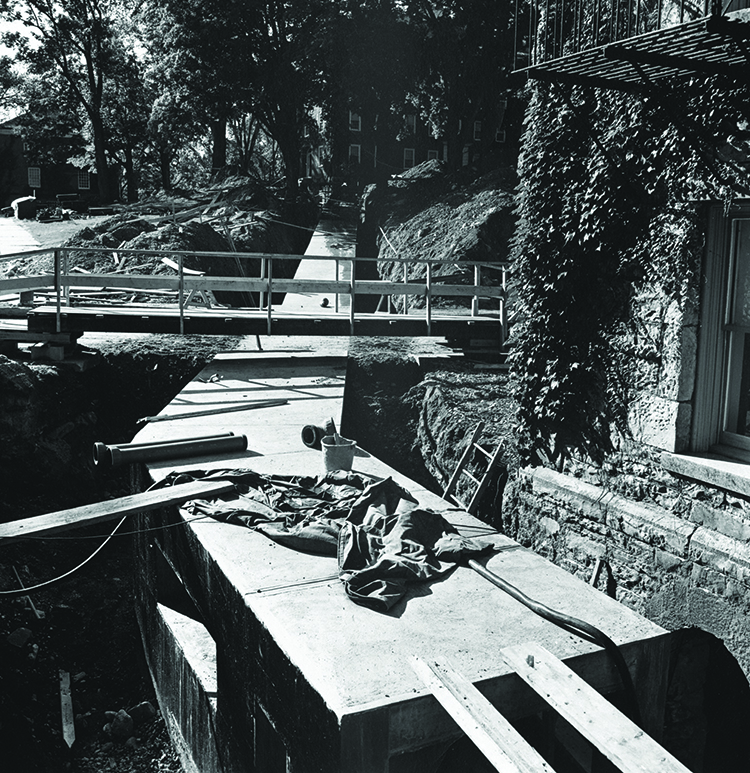 It would be 40 years before Williams would construct another new residence hall. The Perry House “goat room” is named for the unsavory hazing rituals that took place there. FALSE: Nearly half a century after Alpha Delta Phi closed its doors and the fraternity’s stately yellow brick house on Main Street re-opened as Perry House dormitory, students continue to call the dark, windowless, first-floor room at its center the “goat room.” Rumors still circulate about what used to happen in the room, which is now used for the occasional performance or dance party. It’s true that, for some fraternal orders (though none at Williams, as far as we know), an article of initiation was riding blindfolded upon a mechanical “goat.” (Picture a wheelbarrow with a seat and horns to grab onto, operated with much tilting and shaking by senior members.) A 1910 New York Times brief advertised “a mechanical goat, which can be put in the closet when not needed,” suggesting that the devices enjoyed some popularity. Likely they were stored with other fraternity paraphernalia in the goat room. In 2003 the Williams Record published an article debunking historical speculation about outlandish hazing practices on campus. As the article stated, there is no evidence that the former goat rooms still in use—in Perry, Mears House and the Center for Development Economics—ever harbored a goat of any kind. 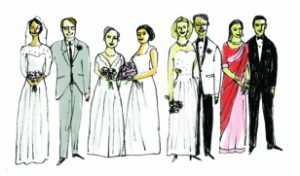 Fifty percent of Williams alumni are married to or partnered with fellow Williams alumni. FALSE: As generations of happily partnered Ephs can attest, chemistry at Williams has never been limited to Thompson Laboratory. But while Williams students and alumni are a high-achieving bunch, the estimate of 50 percent is a stretch. According to the biographical records office, 2,694 Williams alumni from the Class of 1972 onward identify themselves as married to or partnered with other Williams alumni of the same period. 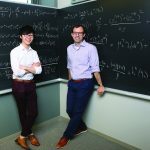 The calculation includes Ephs of all gender identities and expressions, and it totals 21.89 percent of the population of all married or partnered alumni from the Class of ’72 and later. What’s so special about 1972? That’s the very beginning of coeducation, which boosted the chances of Williams-Williams pairings. There are at least two pre-1972 married couples we know of, however. In 1953, Williamstown native Martha Winch took a job at the Williams library, enrolled in some courses and met her husband-to-be, Anil Asher ’55. Martha, who passed away this past March, finished with the Class of ’72. But she always considered 1955 her graduating class. Meanwhile, Kathie Mills was attending Vassar when she met and married her husband, Charlie Berry ’57, their junior year. She finished her coursework at Williams and received a degree retroactively in 1975. But she and Charlie are both ’57, through and through. 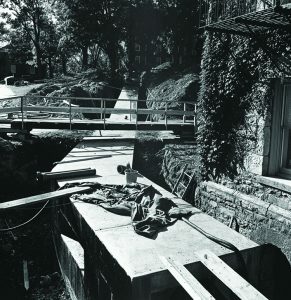 An extensive network of tunnels beneath campus was originally designed for pedestrian use—possibly to allow clandestine movement during wartime or to protect people from the elements. FALSE: There’s no evidence that the tunnels, which deliver high-pressure steam and electrical power from the co-generation heating plant on Latham Street to college buildings, were ever meant to be used by students, faculty or staff to move around campus. That’s not to say people don’t go underground. Facilities staff often walk the tunnels to make sure nothing is leaking and the lights are working. And Ian Nesbitt ’13 made an authorized trip—accompanied by facilities staff and only after receiving confined-space safety training—to map the tunnels and direct-burial steam pipes for a sophomore-year research project. Motion sensors and silent alarms make it much more difficult these days, but “tunneling” was a rite of passage for generations of students. 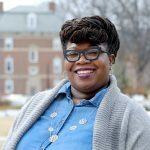 One 1984 alumna remembers tunneling to the pool with friends one cold spring night to swim and paddle around in kayaks. And in the 1950s, a student facing expulsion for missing too many classes used the tunnels to sneak into Hopkins Hall to steal, and later burn, the “cut book”—the binder where such infractions were recorded. Only a handful of fellow fraternity brothers knew his identity, but this hero to the student body went on to work for the CIA. The person responsible for Williams’ school colors is Winston Churchill’s mother. TRUE: A passion for baseball not only earned Williams the distinction of fielding one of the first two collegiate teams in that sport (see p. 29), it also brought the college its color. Today, royal purple—PMS 267 for print, #330066 for the web—is often joined with gold, its opposite or complement on the color wheel. One of the young women responsible for Williams purple, Eugene’s cousin Jennie Jerome, became Lady Randolph Spencer Churchill, mother to Winston Churchill. She also raised money to outfit a hospital ship during the Boer War, authored The Reminiscences of Lady Randolph Churchill and several plays, and founded the Primrose League, a conservative association for discussion and political action that, radical for the time, admitted women. 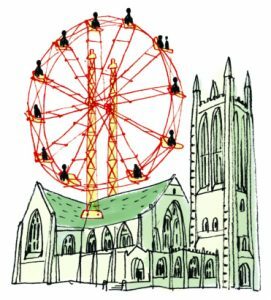 The man whose name adorns Thompson Memorial Chapel was the designer of the Ferris wheel. FALSE: The only connections between the two structures are the name “Ferris” and an accident of regional geography. Bridge builder George Washington Gale Ferris, a graduate of Rensselaer Polytechnic Institute in Troy, N.Y., engineered the first Ferris wheel for the World’s Columbian Exhibition in 1893. At 264 feet and with gondolas that could hold 60 passengers, it was truly a sight to behold. Ferris died three years later of tuberculosis. Meanwhile, the chapel, which opened in 1904, was commissioned by Mary Clark Thompson to honor her late husband, Frederick Ferris Thompson, Class of 1856 (and no relation to George). Although Frederick spent only two years at Williams, he and his wife were generous benefactors to the college. The infirmary and the biology, physics and chemistry labs also bear the family name. Frederick, who served as a college trustee until his death, also gifted the clock in the Lasell Gym tower, was a major contributor to Hopkins Hall’s construction and was instrumental in the construction of the Delta Psi lodge (now home to the Center for Development Economics), having founded the fraternity’s Williams chapter. The college is home to pianos that once belonged to Cole Porter and Bing Crosby. TRUE: Students and alumni have been greeting the mountains with a song “till hill and valley gaily, gaily ring” ever since Washington Gladden, Class of 1859, penned the school’s alma mater tune. And many of them have done so accompanied by a grand piano that once belonged to Williams honorary degree recipient Cole Porter. Porter and his wife, Linda Lee Thomas, bought a home in Williamstown in 1940. When he died in 1964, he left to the college his 40-acre estate, Buxton Hill, and all its contents. Among them was a German Bechstein piano, the preferred mark of Franz Liszt, Richard Wagner and Claude Debussy. Porter used it to write most of Kiss Me, Kate, his best-known musical. The instrument now resides in Thompson Memorial Chapel, where it’s employed for services and events and occasionally charmed to life in quieter hours by students. Bing Crosby sang Porter’s songs in Anything Goes and on other recordings. His piano—a flashy white upright with “Bing” splashed across the upper panel in retro script—came to Williams by way of the legendary bandleader and international showman Paul Whiteman, who hired Crosby in the 1920s. Whiteman donated the instrument and more than 600 linear feet of scores, letters, scrapbooks and other ephemera to the college in the 1930s. Though the college archives displayed the piano for years, it went into storage a decade ago when construction of Sawyer Library commenced. 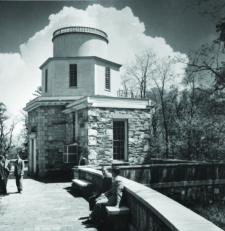 As a condition of their graduation, students attending Williams during construction of the Hopkins Observatory were required to help build it. The passion that made Albert a popular teacher also kindled the enthusiasm of his students, who weren’t required to but turned out “almost in a body to help build the observatory,” Milham writes. The building, completed in 1837 and moved twice before landing on the north side of the Berkshire Quad, is now the oldest existing observatory in the U.S. that has been in constant use. When Williams President Zephaniah Swift Moore resigned from Williams in 1821 to found Amherst College (after several failed attempts to relocate the college to the east), he took with him several faculty, staff and students, as well as library books. FALSE: Few episodes in the chronicles of human infamy have sparked such high-minded, mock-bitter condemnation as the tale of alleged “bibliolarceny” by Williams President Zephaniah Swift Moore and his acolytes as they fled the rugged mountains for the comforts of town. But, gratifying as such a theory might be to loyalists of a scorned alma mater, it simply isn’t true. 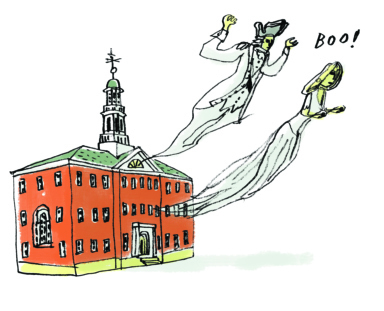 In a 2010 article for Amherst Magazine, “The Great Book Theft That Wasn’t,” Williams’ own Dustin Griffin ’65 notes that contemporary witnesses to the 1821 schism attest that some Williams students, preparing to join President Moore’s migration, “voted at a meeting to carry the library [of the two student literary societies] with them to Amherst.” However, the vote was understood to be taken in a joking manner, and subsequent audits of Williams’ library inventories in the relevant years show few discrepancies. 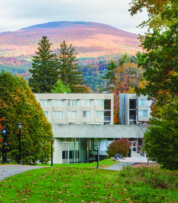 The myth has nevertheless afforded generations of students and alumni on both sides of the Hoosac Range ample opportunity for spirited ribbing. 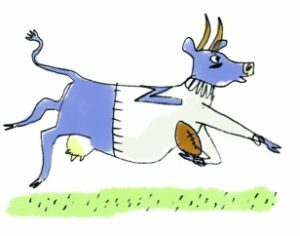 In 1996, Williams’ Mucho Macho Moocow Marching Band presented Amherst with a bill for $1.6 billion in library fines for overdue books. And President Moore’s departure—he took some students with him and later hired away a few faculty—had the happy effect of inspiring the formation of the Williams College Society of Alumni, the oldest continually running alumni society in the U.S.
Williams’ purple cow mascot is a mash-up of the purple mountains and the cows that roam nearby fields. 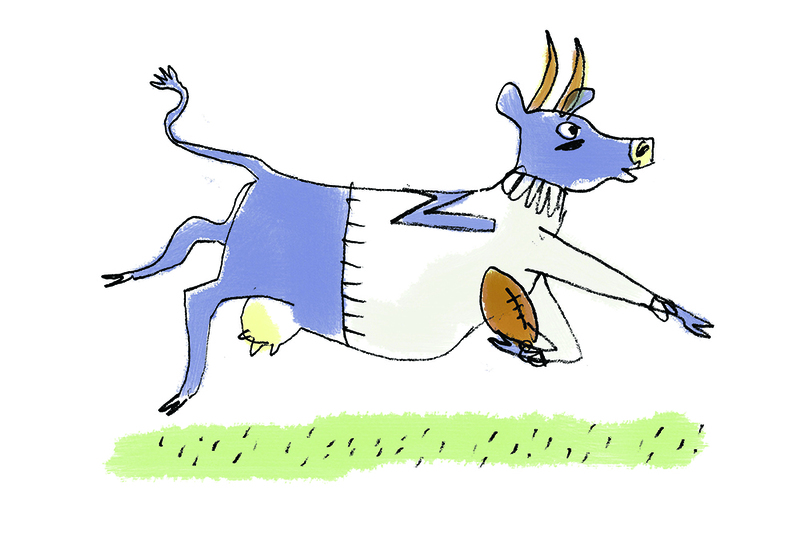 FALSE: In 1907, Purple Cow magazine made its debut on campus. That venerable publication (former Williams President John Edward Sawyer ’39 is among its editorial alumni) took its name from the now-familiar verse by Gelett Burgess in which the poet expresses his distaste for an elusive, imaginary creature of his own invention. We don’t know exactly how that beloved mythical beast—dubbed “Ephelia” in a 1952 WMS Radio naming contest—found her way from the masthead to the athletic fields. Some sources suggest she was elected by a vote of the student body in 1907, but no account is definitive. We do know she starred in a 2010 television commercial for ESPN’s College GameDay alongside the Florida Gator, the Oregon Duck and the Georgia Bulldog. And she earned praise from Reader’s Digest as America’s “most lovable mascot” in 2011. The first-ever intercollegiate baseball game was played at Williams. TRUE: In the mid-1800s, the game we know as baseball was played using at least two sets of rules. There was the “Massachusetts” game, also known as “town ball,” in which batters could hit the ball in any direction, as in cricket, and outs could be obtained by “soaking” or striking the runner with a thrown ball. And there was the “New York” game—probably safer, certainly more orderly and much closer to the modern game—reflected in the Knickerbocker Rules of 1845. Williams played the first Massachusetts game against Amherst on Friday, July 1, 1859, on the grounds of the Base-Ball Club in Pittsfield. The match lasted nearly four hours and ended disappointingly for Williams in a score of 73-32. Back in Pittsfield, Williams and Amherst players set aside their rivalry and retired to the nearby United States Hotel for toasts, speeches and dinner. Enthusiasm sparked by the contest led to the creation of class and intramural teams at Williams. The game also caught on at other schools: Harvard and Yale established their first baseball clubs in 1862 and 1865, respectively. 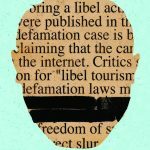 Abe Loomis is a writer living in Western Massachusetts. Special thanks to student assistant Sarah Stone ’18 in communications and to Williams Archives and Special Collections for their research assistance.